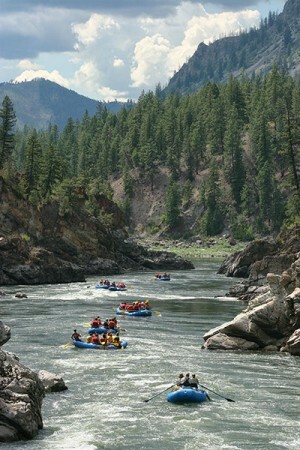 Join us for some whitewater rafting through this amazing canyon section of the Clark Fork River called the Alberton Gorge. This 12 mile, class III whitewater run makes a perfect trip on a hot summer day. The Alberton Gorge near Missoula is the best summer whitewater in western Montana and makes a great addition to any Montana vacation. This river is appropriate for beginner paddlers and during the summer for kids six years and older. 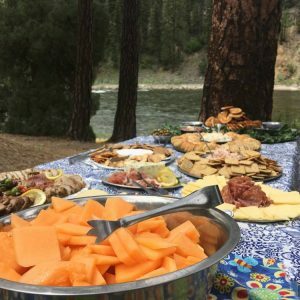 We offer a variety of trips: Full day trips with a lunch stop and the confluence of Fish Creek and the Clark Fork or a Half day trip that covers the same section of river but with no lunch stop. This trip is the perfect adventure option for visiting wedding guests, family & friends reunions and much more. Be sure to call for our competitive group discounts. For an extra special event, plan an afternoon trip with appetizers at Fish Creek or a gourmet dinner float with full BBQ dinner. The “Clark’s Fork of the Columbia,” named after William Clark, is a major tributary of the mighty Columbia River. Why didn’t Lewis and Clark take the Clark Fork River instead of their arduous journey over the Lolo Trail? After deciding the Salmon River was too rough and banks to steep they traveled down the Bitterroot River and came to the Missoula valley. Lewis & Clark debated the best route to the Pacific. With the advice of their native American guides, they knew they needed to reach rivers and waters with salmon. This would ensure they were on the drainages that eventually flowed to the Pacific. Even though the Clark’s Fork does flow to the Pacific, there were no salmon due to obstructions/falls downstream. The Alberton Gorge of the Clark Fork River was formed during the most recent ice-age, approximately 15,000 year ago when up to 30 miles of ice impounded Glacial Lake Missoula. Water breached the ice dam, and catastrophic floods followed, more than a dozen times, violently creating the spectacular rock formations and the river run at Alberton Gorge. Luckily, this Class II-III whitewater is located just minutes from Missoula. Group discounts available, contact us for a quote. Let us know your estimated group size. We specialize in custom group adventures! Check-in time: 12:30 and returns approx 7 pm, custom group meeting times can be arranged. Check-in time: 12:30 pm and returns approx 8:00 pm, relaxed pace, custom group meeting times can be arranged. Call us for a custom sample gourmet BBQ menu. We have trips departing nearly everyday, but not always every trip we offer everyday, so call ahead to confirm which trips are departing any given day. Most Alberton Gorge Trips depart from our office at 912 E. Broadway, Missoula MT, we can also meet you at the Cyr River Put-in or custom pick up location can be arranged for large groups. Return times are estimations and depend on water level, allow for delays. –We provide a professional whitewater guide, transportation to and from our office, paddle, Coast Guard approved PFD and beverages for the return drive.